I’ve been visiting rehab lately. Something about that sentence has a whole lot of shock value until I clarify that I was going to visit my grandmother who was getting physical therapy/rehab for a broken arm. After a number of weeks and an operation to reset the bones with pins, the powers that be at her insurance company decided they were done paying for her stay at the facility. And that was that. Yup, my 90 year old grandmother got kicked out of rehab. I can add that to the list of things I never thought I’d hear myself say. I’m at the point in my life where I’m flanked by life beginning and ending. On one hand there is Miss Libby just starting out on this journey. On the other is my grandmother whose journey is winding down. And both metaphorically as well as mathematically I am almost exactly in the middle of the two. Somehow that feels so very right. I get to watch Libby’s light grow and shine while I also get to see my grandmother’s fade. Both are a privilege but there is sadness in the certainty of knowing I face a profound loss ahead. I was talking about this recently with a friend and said how unfair I thought it was that after such a long life my grandmother should be facing a growing list of health issues. And my friend said something that really made me think. She reminded me that it takes time for a life to begin. And it takes time for a life to end. The notion of people peacefully passing on in their sleep? It looks nice in the movies, but life isn’t The Notebook. So what I’m seeing, and struggling with, this is part of the process. That doesn’t make me dislike it any less. But at least I can look at it a little differently now. And in those moments when my heart breaks just a little at seeing my grandmother look so old and frail, I can take comfort in the delight she gets from seeing Libby’s joy and wonder unfold at the world around her. Note: This is all about comfort. I’m not suggesting that you should feed your feelings…well, maybe I am. But there is something reassuring about ground beef, macaroni, and cheese. Maybe it’s the simplicity of the dish. Or maybe it’s just a trifecta of perfection. Mine is not to reason why…yours shouldn’t be either…just enjoy. Brown the beef and onion in a large skillet on medium high heat, breaking the beef apart with your spoon or spatula as it browns. While the beef and onion cooks, combine the beef broth, mustard, ketchup, and salt in a bowl. Once the beef is no longer pink, drain off most of the grease (remember, there’s a lot of flavor in those drippings). Add the broth mixture to your pan with the beef and bring to a boil. Add the macaroni, give it a stir, and then cover the pan. Reduce the heat to medium and cook for approximately 10 to 12 minutes until the macaroni is tender. Add the cheese, stir to combine, and dig in to a heaping bowl of comfort. I swear this rambling is going to get to a point….and a recipe. Parenting styles. Seems like there is a new one every week. I hope to avoid becoming any type of parenting caricature…tiger, helicopter… by embracing the things that work for me and creating my own style. That may mean…and this may sound crazy…that I don’t tell Lib she has to share her toys, books, and what have you. What if I teach her the value of taking turns so that she understands you don’t automatically get something just because you want it? How about if I get her to understand that sometimes you have to wait your turn? And that she also don’t have to give something up just because someone else also wants it. They also need to wait their turn. Crazy right? How many ideas sounded crazy at first? Electricity? Cars? Flight? Once upon a time they were fringe ideas. Now they are taken for granted as being universally true and necessary. And dare I say, they make life easier. As someone who is for things that make life easier…I’m down with all that. I am also down with mac and cheese. 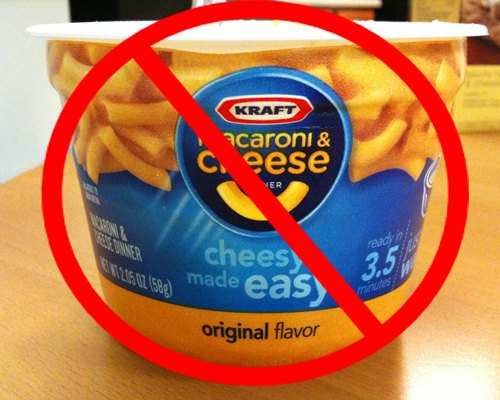 Not that mac and cheese is revolutionary in any way. But we have come to expect it to be quick and easy. It is even packaged in uber easy single servings. Here comes the crazy. 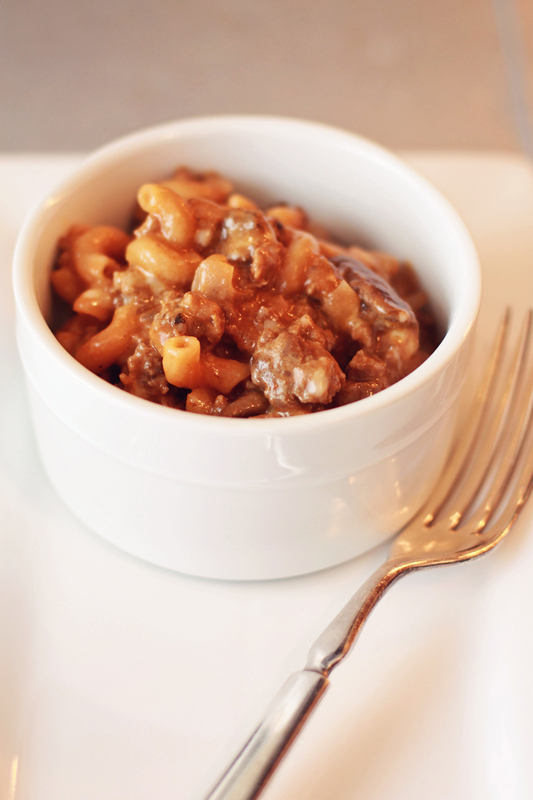 Single serve mac and cheese can be easy even when you make it from scratch. Crazy? Universally true and necessary? You decide. BAH Note: If you have more than one mouth waiting to get some of this, go ahead and double the recipe. And even if you only have one mouth waiting for this, you still might want to make a double batch. If you don’t tell, I won’t judge. Combine the macaroni and water in a medium size microwave safe bowl, preferably one with handles. Microwave on high for 4 to 8 minutes, stirring every 2 minutes, until the pasta is almost al dente. If your pasta starts to dry out before it is done cooking, add an additional two tablespoons of water and continue cooking. Add the milk, cheese, and flour to the bowl and stir to combine. Microwave in 30 second increments until the cheese, milk, and flour have turned into a sauce. Taste for seasoning and add kosher salt to taste. The following post originally appeared on BAH on 2 September 2009. 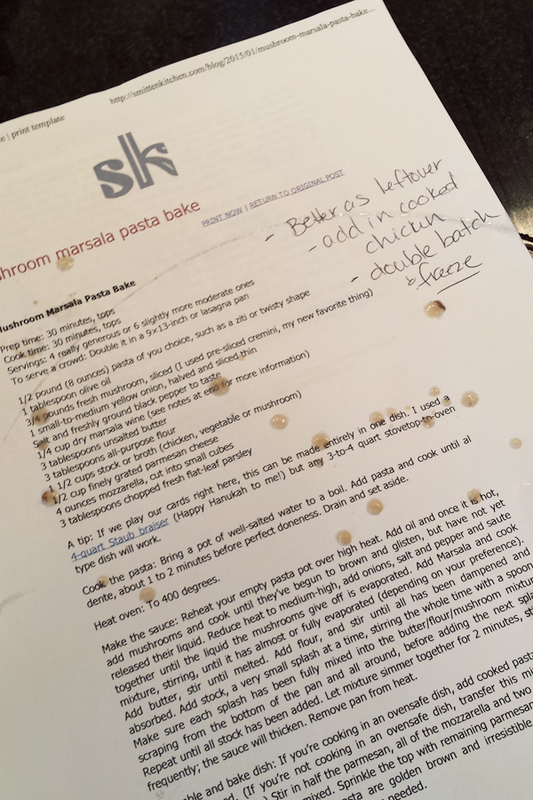 I can’t decide if I like this recipe or not. Maybe it needs a different cheese because the smoked Gouda seemed to overwhelm everything else. Other than a cheese substitution, would you make any other changes? 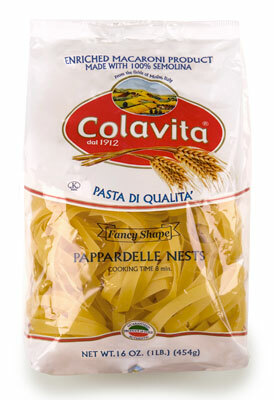 this is the actual pasta i used. there were no leftovers to document its existence. Things have been a little weird lately. I feel like I can’t string together a story to save my life. Is it possible that after nearly five years of blogging I’ve finally run out of things to say? Maybe. But there is definitely weirdness to me in not sitting down regularly and writing. We are knee deep in our adoption home study. Reports are being written, facts are being gathered, referenced are being interviewed. It’s a lot of hurry up and wait to get to the next part of the process. And frankly, there’s not a lot of anything I can actively manage about this part of the experience. I can’t plan, or make, or do anything in a physical sense. So there’s weirdness in the sense that I feel like I “should” be more engaged and excited about this than I am right now. There’s also been house weirdness. Just in the last few days our doorbell has started ringing at unexpected moments. As a matter of fact, about halfway through the previous paragraph, it rang. I didn’t bother to check and see who was at the door though. That’s because for the last six months or so our doorbell has been sitting in a dish on a bookcase. It’s one of those remote systems that has a battery operated button that sticks to your door frame and a ringer that hides away somewhere inside your house. The adhesive on the button gave out last summer and I kept finding it laying on our front porch. So I brought it inside and dropped it in the dish where we keep our keys, meaning to find some stronger adhesive and reinstall it outside. Over the weekend, the bell just started ringing. I figured maybe the keys were pressing the button and activating the bell so I moved things around a bit in the dish. The bell rang again. Then I took the button out of the dish and set it face up on the bookcase. That was yesterday. Today the bell has gone off three times. I know the reasonable solution is to take the batteries out of the thing but I kind of like the idea of someone’s energy finding a way to let me know they came by to say hello…as long as they don’t do it in the middle of the night. What does any of this have to do with pappardelle with mushrooms? Not a damn thing. But like I said, the storytelling is giving me fits. BAH Note: I am terrible timing my dishes so that they are all done at the same time. So while my water came to a boil, I started on the sauce. When I got to the point where the chicken broth had reduced by half, I turned off the heat and let it sit until the pasta had gone into the water. I then finished off the sauce and kept it on a low flame until it was time to introduce it to the pasta. Bring a large pot of well salted water to a boil and cook the pasta according to the package’s direction. While the water heats and the pasta cooks, combine the olive oil and butter in a large frying pan over medium heat. Once the butter has melted, add the sliced mushrooms, italian seasoning, and salt to the pan and cook until they have released their liquid and begin to brown, stirring often. Add the chicken broth to the pan and cook until the liquid has reduced by about half. Slowly stir a few tablespoons of the reduced pan sauce into the heavy cream to temper it. Then add the tempered cream to the frying pan and whisk to combine. Stir in the lemon zest and taste for seasoning. Add additional kosher salt and black pepper to taste. Once the pasta has cooked, drain the noodles and add them to the pan with the sauce. Stir to allow the pasta and sauce to combine and then stir in the grated parmesan if using. The following originally appeared on 5/6/09 at Exit 51. Today’s recipe comes to you from the pages of Bon Appetit: Fast, Easy, Fresh. I was still grousing about the feta cheese that was sacrificed in the name of their Garlicky Beans with Feta, but I decided to move on to the next dish I had tagged. I really don’t know that I can ever forgive them for that one. After making their Orzo with Tomatoes, Feta, and Green Onion, I really wish I had found this back in the days before our South Beach adventure. Because it’s that good. It’s also that easy. And it does not cause any regrets when it comes to its usage of the feta. So maybe, just maybe, I can pretend like that whole Garlicky Bean thing never happened after all. This dish would be great for a potluck or a light summer meal. Although, you may want to scale it down if you’re not feeding a crowd. A pound of orzo is still a lot of pasta. If you do make the entire pound, be sure you use a bowl big enough so that you can mix and stir without shooting orzo all over your kitchen. It took me a few tries to get it right. Feel free to tweak the vinaigrette recipe to your liking. I like mine more tangy so I used less olive oil than called for, and added more lemon juice and honey. Whisk vinegar, lemon juice, and honey in a small bowl. Gradually whisk in oil. Season to taste with salt and pepper. Boil broth in a large saucepan. Stir in orzo, reduce heat to medium, and boil until just tender but still firm to the bite, stirring occasionally. Drain. Transfer orzo to large, wide bowl, tossing frequently to cool. Mix tomatoes, basil, green onion into cooled orzo. Add vinaigrette; toss to coat. Season to taste with salt and pepper. Serve at room temperature. Bruce and Mark were gracious enough to share The Complete Quick Cook with me and answer my questions. And you may be thinking “well that’s great for you and all but what about me?” Dear, dear friends, I would never forget about you. I wanted to put this in a box and wrap it in shiny, sparkly paper before I gave it to you. 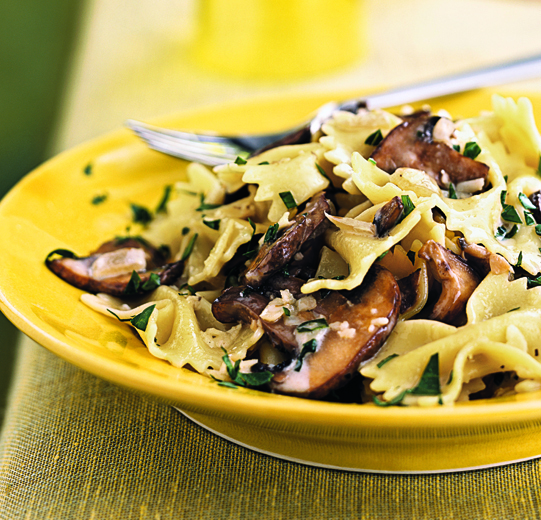 But Farfalle with Creamy Mushroom Sauce doesn’t readily lend itself to gift wrapping. What it does lend itself to is easy transformations based on whatever extras you happen to have on hand. I doubled the amount of mushrooms, thickened the sauce with a combination of butter and flour, and added diced chicken breast and peas. That’s how I made it my own. You do what you like. So without further ado, I give you my newest comfort food bff. Melt butter in a large nonstick skillet over medium-high heat. Add mushrooms, onion, shallots, garlic, 1 teaspoon salt, and pepper; cook 12 minutes or until liquid evaporates and mushrooms are tender, stirring occasionally. Add wine; cook 2 minutes or until liquid evaporates, stirring occasionally. Remove from heat. Add pasta, cream, cheese, and 2 tablespoons parsley, tossing gently to coat. Stir in remaining 1/2 teaspoon salt. Garnish with minced fresh parsley, if desired. Serve immedi­ately. YIELD: 8 servings (serving size: 1 1/4 cups).